Prof. Kirit Mankodi studied Archaeology for his MA and PhD. He is attached to the Project for Indian Cultural Studies, Mumbai. He is the author of 'The Queen's Stepwell at Patan', and other publications. Temples and other charitable edifices in India were built for certain purposes such as the fulfilment of religious observances and to accumulate merit (puṇya) for oneself or for others. The extensive literature on Dharmaśāstra composed when the older Vedic cult of elaborate sacrifice was still current but when simultaneously the Smārta/ Pauranic Hindu practices were also coming into prominence, has described religious acts as iṣṭapūrta (Kane 1941:II.2:844). The term iṣṭa refers to the performance of a sacrifice in the Vedic cult, and pūrta denotes undertakings such as temples, reservoirs or wells, and other social acts in conformity with the Pauranic religion. Many inscriptions as well as oral tradition testify to the practice of digging wells in memory of deceased relatives. For example, an inscription from Mandasor in Malwa from 532 CE records that Dakṣa, an official at the court of Daśapura/Mandasor, excavated a well in memory of his uncle. Another inscription from Vasantgarh in the Sirohi district of Rajasthan records that Lāhiṇī, a widowed queen, renovated a step well in 1042 CE, after the death of her husband. The imagery employed by the composer of Lāhiṇī’s inscription, which describes the flights of steps as ‘auspicious and firmly bonded, as though a ladder leading up to heaven’, clearly brings out that it was a pious act in memory of her husband. The Rani ki Baodi stepped well at Bundi in Rajasthan was built by the widow of king Aniruddh Singh in the late 17th century. And the reservoirs at Dholka and Viramgam were commemorative excavations by Mayaṇalladevī, mother of the Solanki king Siddharāja Jayasiṁha (Mankodi 1991:234–35). Udayamati, therefore, in constructing the Ran-ki-Vav step well as a memorial was following a well-established tradition. As many as 15 images of Śaiva Devīs, who may be regarded as members of the Twelve Gaurīs (Dvādaśagaurī, who are at the centre of a cult exclusive to women), are present at the site today (Figs. 1-2). The Gaurīs are named Umā, Pārvatī, Gaurī, Lalitā, Śriyā, Kṛṣṇā, Māheśvarī, Rambhā, Sāvitrī, Triṣaṇḍā, Totalā and Tripurā. While Gaurī is the name of one member of the composite group of 12, this group as a whole is also referred to as the Twelve Gaurīs. Their blessings are traditionally invoked by married women (saubhāgya) for marital fulfilment. 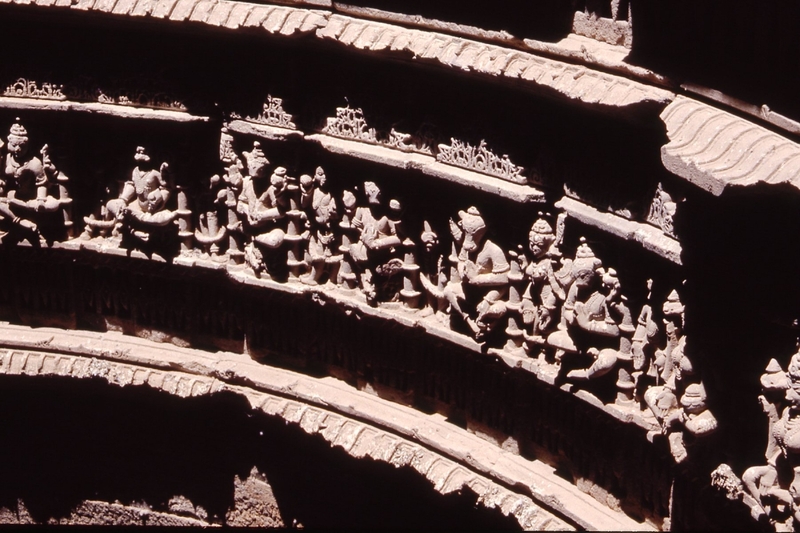 Amongst the 12, Pārvatī (who is also named Umā or Gaurī, the names being interchangeable) was often represented as performing ‘the austerities of the five fires’ (pañcāgnitapasyā). This is a harsh penance, for the purpose of obtaining one’s wish, performed by standing in the midst of four fire altars while gazing up at the sun which was referred to as the fifth fire in the sky. It is this theme that occurs most often in the surviving 15 images of the stepped well. The myth of Gaurī is well known: Pārvatī in her earlier birth was known as Satī, daughter of Dakṣa Prajāpati. She married Śiva, ‘the naked wanderer of burning grounds’, who kept the company of snakes and wild animals. Due to this, Satī was disowned by her father. Once when Dakṣa performed a great Vedic sacrifice, Satī attended it uninvited and when her father insulted her she threw herself into the fire. Satī was then reborn as the daughter of the snowy mountain Himālaya and performed the austerities of the Five Fires to once again become the wife of Śiva. 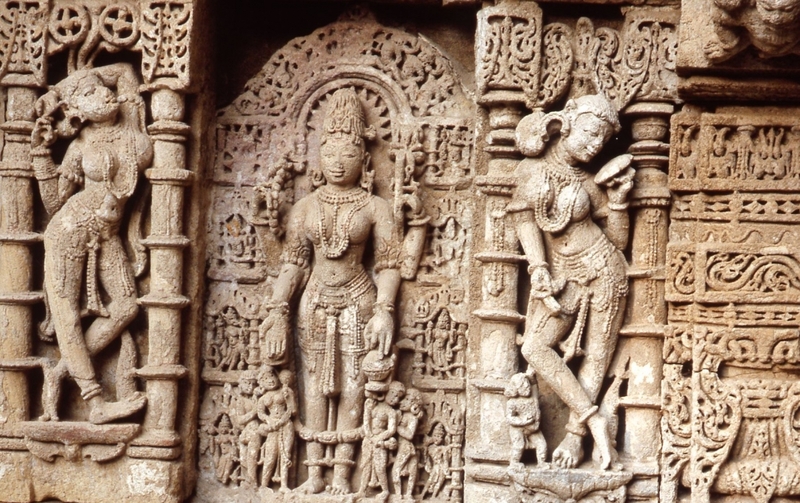 The powerful story of Pārvatī’s penance came to symbolize a wife’s steadfast devotion to her husband, and her desire to remain united with him in all her future incarnations.If the Ran-ki-Vav was indeed a commemorative structure, then the many images of Pārvatī’s penance that adorn all parts of the corridor may have had symbolic significance. Udayamati may have been portrayed as Pārvatī, separated from Śiva, and practising austerities for her reunion with him was a reference to her own tragic widowhood, and her own yearning for a reunion with Bhīmadeva. Pārvatī serves as the archetype for the queen, the act of the grieving queen is equated with that of the grieving Gaurī. This was Udayamati’s way of coming to terms with her situation, as it was of all women in a similar condition. We have already seen that the pūrta acts of digging wells or building temples replaced the sacrificial iṣṭa acts of the Vedic period. In a similar vein, the sacrifice of goddess Pārvatī may be compared to the pūrta act of Udayamati. The theme of reunion and liberation is reinforced in other ways as well. At the lowest level of the well, where the first ring of sculptures appears above the plain paved wall, a group of eight Vasus is prominently placed. The Vasus are youthful gods, who are always depicted in a group of eight, each with a different name: Dhara, Dhruva, Soma, Āpa, Anala, Anila, Pratyūṣa and Prabhāsa. According to a myth recorded in the Mahābhārata, the wife of one of the Vasus became enamoured of the cow of sage Vasiṣṭha. The Vasus stole the cow and in return the sage laid a curse upon them which caused them to lose their divine status and be born on earth as mortals. They could only regain their divinity with the help of the sacred River Gaṅgā. Here, on the earthly plane, King Śāntanu of Hastināpura, ancestor of the Kauravas and Pāṇḍavas, heroes of the Mahābhārata, while strolling on the bank of the Gaṅgā, saw the river Gaṅgā herself as a beautiful girl, and desired to marry her. Gaṅgā agreed, on condition that the King would never call her actions into question, else she would leave him. When a son was born to the couple, the queen took him to the river and drowned him in the Gaṅgā. Another son was born, then another and in this way seven sons were consigned to the river. The infatuated Śāntanu refrained from challenging his wife, but when an eighth infant was about to be drowned, the king could bear it no longer and stopped his wife. Gaṅgā made known to Śāntanu how she had only been carrying out what fate had determined and that these were the eight Vasus who needed her to release them in order to regain divinity. As the King had broken his word, Ganga returned to heaven. The last of the Vasus, born as the eighth son of Śāntanu and Gaṅgā, whose release did not happen, remained on earth and was endowed with divine splendour. He was named as prince Devavrata who later became the famous hero of the Mahābhārata, Bhīṣma. The Vasus’ birth as sons of the sacred river Gaṅgā, and their release with her help, gives ‘meaning’ to the representations of the Vasus here in the stepped well, their bovine heads being perhaps a consequence of the curse of stealing the sage’s cow. In Udayamati’s memorial, the same myth is illustrated. The bovine-faced Vasus (in a reference to their sin) are at the very edge of the water, folding their hands, hailing their mother, who both generated them and also liberated them (Figs. 3 and 4). Sometime after the stepped well was excavated, an unknown donor installed a portrait of Udayamati herself. This marble slab (Fig. 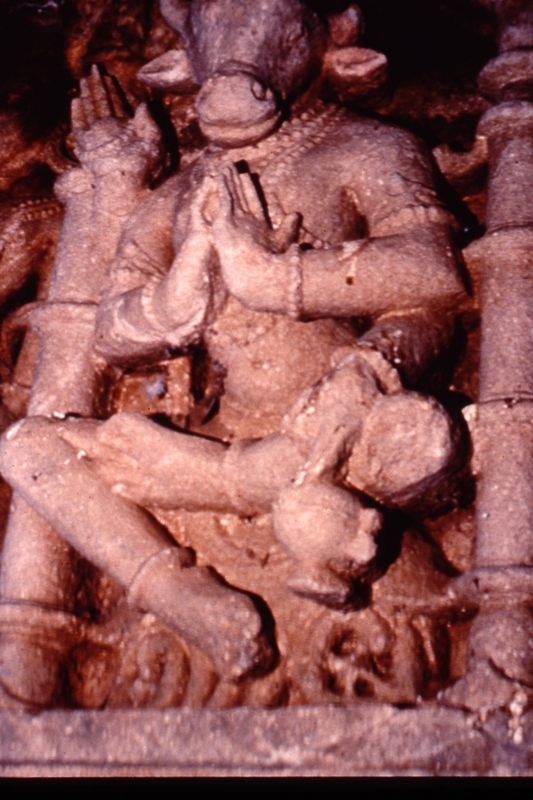 5), about half a metre in height, is an idealized portrait in which Udayamati is seated on a cushion. She bears a lotus flower in her right hand; the left hand rests in the lap, and holds an indistinct curved object, such as a book, or a slab for sandalwood paste. In the scene, as many as five people attend to her, testifying to her exalted status: two female figures flank her at the level of her shoulders, one with her arm in the attitude of adoration (patākāhasta), and the other bearing a parasol. Three smaller male figures, either with garlands in hands, or joining their hands in worship, are at the level of the seat. A short inscription on the face of the seat reads ‘Mahārājñī Śrī Udayamati’. The sculpture and the writing date to the 13th century. Jinavijaya, Muni. ed. 1933. Śrī Merutuṅgaācāryaviracita Prabandhacintāmaṇi, Prathama Bhaga. Santiniketan, Singhi Jaina Jnanapitha. Kane, P.V. 1941 History of Dharmaśāstra, vol. 2, part 2. Poona: Bhandarkar Oriental Research Institute. Krishna, Deva. 1984. ‘Iconography of Pārvatī as Tapasvini’, Bharati (Varanasi) New Series, vol. 1:1–4. Mankodi, Kirit. 1991. The Queen’s Stepwell at Patan. Bombay: Franco-Indian Research Pvt. Ltd.
Tawney, C.H. 1899. The Prabandhacintāmanṇī or Wishing Stone of a Narrative Composed by Merutuṅga Āchārya. Bibliotheca Indica Series 931. Calcutta: Asiatic Society. Trivedi, R.D. 1981. Iconography of Pārvatī. Delhi: Agam Kala Prakashan.